Pharma Marketing Blog: FDA's Bad Ad Program is "Phoniest Thing Ever!" FDA's Bad Ad Program is "Phoniest Thing Ever!" So says Jerry Roth, president of Sanford, Fla.-based Hill Dermaceuticals. His company received the ONLY letter from the FDA as as a result of a complaint received via DDMAC's (Division of Drug Marketing, Advertising, and Communication) Bad Ad Program (see here). According to Advertising Age, FDA received 239 complaints to the Bad Ad program from its launch in May through January of this year. 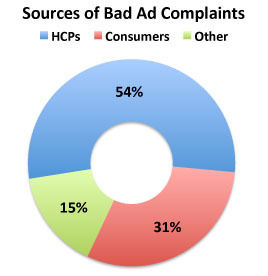 "Of these complaints, 129 (54%) have come from health-care providers, 73 (31%) from consumers, and the remainder from other sources. Of the 239 complaints, approximately 135 were deemed to have sufficient merit for further investigation, with approximately 50% falling within DDMAC oversight and the rest being referred to other centers within FDA." According to DrugWonk's Peter Pitt, "At best this effort isn’t, um, cost effective" (see here). I myself submitted a compliant to the FDA regarding this Lyrica DTC Ad. I didn't get any response from the FDA due to this "technical glitch" in the auto-response to submissions to its BadAd program. The belated response came from "Bob Dean," the lead consumer safety officer for DDMAC. Dean worked as Senior Specialty Sales Representative at Johnson and Johnson for five years and as a Sales representative at UCB for 2 years (see his LinkedIn profile). Mr Roth claims DDMAC acted on a complaint filed by "a doctor for another [competing] company," which is interesting. The FDA solicited complaints from doctors because "prescriber[s] can play an important role in ensuring that prescription drug advertising and promotion is truthful by recognizing and reporting misleading drug advertising and promotion." But because so many -- perhaps up to 80% of -- "prescribers" are employed directly or indirectly by pharmaceutical companies, the Bad Ad program is open to criticisms similar to Mr Roth's. Roth also said "I sell my products at around $50 a prescription when the average prescription is near $200. So you figure out why they came after me." Given Mr. Dean's background in Big Pharma, I can feel Mr. Roth's pain! The letter Hill Dermaceuticals received cited that certain pages on the company's website were "false or misleading because they omit and minimize the risks associated with the use of Derma-Smoothe Body Oil, overstate its efficacy, present unsubstantiated superiority claims, broaden and inadequately communicate the indication, and present unsubstantiated claims for the drug product." This is interesting because that's EXACTLY what I said about Pfizer's Lyrica DTC Ad! The question is, Is FDA's Bad Ad program biased, ineffective, not cost effective, or all of the above? Take my little survey and tell me what you think. P.S. FDA is hosting a Bad Ads Program webinar titled, "An Overview of the FDA’s Bad Ad Program," on Thursday, at 12 Noon (ET), April 28, 2011 (see here). Catherine Gray, Pharm.D., will present an overview of the FDA’s "Bad Ad" program, specifically focusing on how to identify misleading prescription drug promotion and report this activity to the agency. The BadAd webinar was unremarkable, except for excessive self-promotion. Anyone who had access to the program would surely be sophisticated enough to know DDMAC and its designs without having to listen to that insipid introduction. The program could have benefitted from targeting to a higher education level and the FDA.gov advertisment should carry a boxed warning about the vapid and patronizing content. You mean it should have been more "balanced?"